There is nothing better than enjoying a holiday on the best Mexican beaches and experience some of the activities that only such destinations can offer. Do you want to know more to plan a unique holiday? Keep reading! Mexico stands out due to its great variety of ecosystems, mountains, forests, jungles, deserts and beaches. In fact, Mexico is very popular with foreigners and national tourists for its beautiful beaches and unmatched and magical landscapes. The beach is located near the small town of Cabo San Lucas, in a strategic area given that Cabo San Lucas receives large amounts of foreign tourists yet preserves its Mexican essence. Near this incredible beach, you can see gray wheals, walk through the Baja California wine route and practice aquatic sports like aquatic skiing, fishing and kayaking. The Riviera Nayarit differentiates itself by its landscape, warmth and variety of activities that you can do there. Sayulita beach is, for example, very well known for its waves that are perfect to practice surf. In this region, a lot of international championships have taken place in which surfers from all around the world have participated. This beach is perfect if you want somewhere with few tourists, the Caribbean sea and white and fine sand. 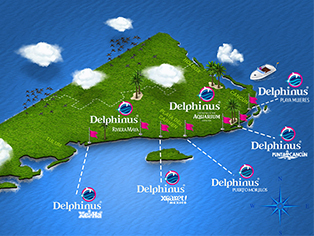 This destination is ideal to do certain activities that can’t be done elsewhere like a swim with dolphins. 33 km away from one of the most important cities in Quintana Roo, Cancun; Puerto Morelos has a natural habitat to live the experience of swimming with dolphins, this will make you value the importance of this marine mammal in our ecosystem. Apart from this, you can practice snorkeling and diving and can explore sacred cenotes that once were a very important place for the Mayan culture. Oaxaca is one of the places in Mexico that seems to have it all. Located on the coast, Puerto Escondido is well known, just like Sayulita, for its unique waves that make it one of the 10 best international destinations to practice surf. There are so many other things to do at this beach: it has a very impressive birds sanctuary, where you can see pelicans, hawks, hummingbirds or herons. The landscape surrounded by rocks will give you the impression of being in an unexplored environment. All foreign tourists know of one place in Mexico and that is certainly Cancun. The Cancun beaches belong to the Mexican Caribbean and are characterized by the incredible sea color, the fineness of the sand and the warm and shallow waters. This destination offers a great variety of activities such as diving, swim with dolphins, water skiing, swimming along the subterranean rivers, visiting sacred cenotes or going on tours to the archaeological zones that form a huge part of the legendary Mayan culture. Summertime is perfect to visit any of the beach options in this article, from the Caribbean to the Mexican pacific coast, the variety is wide and for all kind of tourists. Ready to discover this selection of Mexican beaches we brought to you? Don’t forget to book your swim with dolphins experience in advance just like all your other activities, we're ready for the holidays!